Nobles loves the sport but was hampered by cramping, a family condition shared by his sister, father, and grandfather. “I come from a proud line of crampers, he jokes, but his teammates were exasperated by the interruptions every few hours. “Nobody wants a teammate who’s standing there locked up and can’t move. I’d be a liability to my teammates” One teammate recommended The Right Stuff (NASA-developed zero carb, electrolyte drink additive), and Nobles tried it first at a mountain bike race, the Shenandoah Mountain 100. I started taking The Right Stuff. I made it through the whole race and didn’t cramp once. Now I’m in love with the stuff. Nobles uses The Right Stuff at least weekly. “That is my drug of choice,” he says. “If I’m going over an hour, that’s when I use it. I train pretty hard. I’ve been doing a lot of racing lately.” He participated in the Krispy Kreme Challenge, a charity race from the N.C. State University campus to a downtown Raleigh doughnut shop several miles away where runners consume a dozen doughnuts before racing back, all in less than an hour. 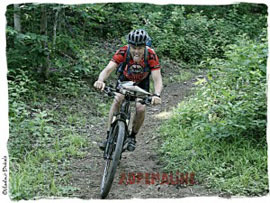 This entry was posted in Athlete Testimonials, Cramping, Dehydration Symptoms, Endurance Sports, Endurance Training, Hydration and tagged Adventure Racing, athlete hydration, cramping, cramps, Dehydration Symptoms. Bookmark the permalink. National Champion High Jumper Set the Bar High! Ultra-Runner Shares How She Wins at Everything!